Help a naughty little puppy play fetch the stick with his squirrel master. With 10 levels set in beautiful backdrops, this game is fast, easy and totally addictive. Stay away from the sly black cats and ferocious bull dog. Collect bones for bonus points and keep and eye on the clock. Challenging terrain, complete with moving platforms and unique themes make this game a must play! 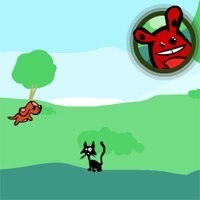 Use the LEFT and RIGHT arrow keys to make the puppy run. Press the SPACEBAR to make the puppy jump.